Abstract: This paper explores medieval environmental attitudes through a historical reading of Sir Gawain and the Green Knight, the study of which provides a blueprint for what may be a method of combating climate change denial at its cultural roots, which I will argue in this paper links to an outdated mode of European warrior masculinity. This paper will demonstrate the connections between hegemonic masculinity and environmental degradation at work as a discourse in Sir Gawain and the Green Knight through chivalric behaviors, as well as a burgeoning environmental conscientiousness at play that undermines it. 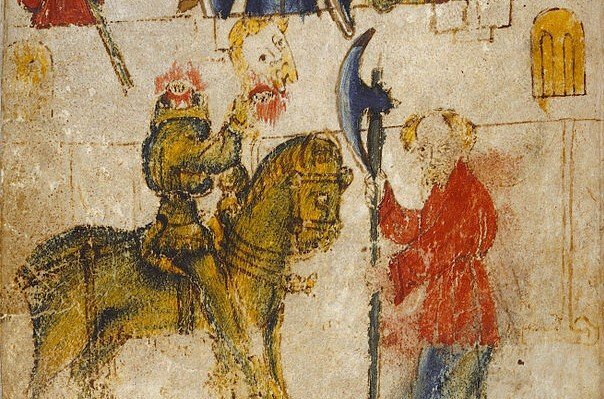 The conflict between Gawain and the Green Knight is a struggle to detoxify certain elements of chivalric warrior masculinity, and through a close reading of the text we can relate this project towards today’s goal of countering the specifically male-resistance toward embracing sustainability, making ‘green’ friendlier to masculine identities. Introduction: Climate change is the most complex and universal threat that humanity has ever faced. Although scientists have reached a consensus in recognizing the great challenge looming before the whole of humanity, leaders in politics and business, especially in the United States, have not adequately met the challenge of global climate change and global environmental change. Where natural science fails, criticism, social science, and art must step in both to analyze factors surrounding the reluctance to action, and strategically motivate those resistant to the cause. In Ecocriticism, Greg Garrard recognizes the need for such endeavors, especially concerning issues of global importance. It “demands a politicized reading practice more akin to social ecology and Cultural Studies than to deep ecology and traditional literary studies”. In order to confront the issue of the United States’ slow response to tackling global climate change, one must identify the discourses at work, identifiable in literature and other cultural artifacts, which resist the long-term, sustainable thinking that is needed to face the issues of today and tomorrow. In American politics, that problem is unequivocally climate change denial.